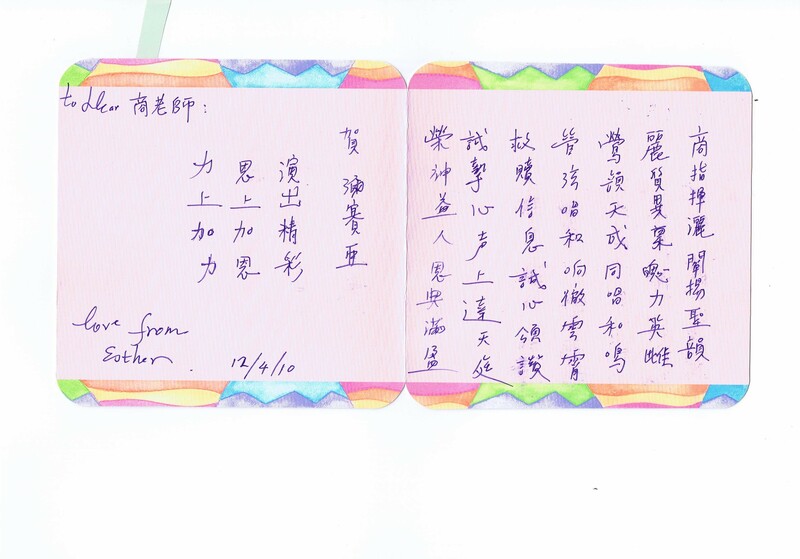 Please visit http://minchao999.blogspot.com/2015/07/esther_2.html for the entire memorial service photos, videos and articles. Three days after returning from Taiwan, I received an e-mail from I-Ling that Esther was in ICU. Esther went through surgeries after surgeries in the first few days. We took turns to visit her and prayed with her family members. In another few weeks, doctors and family members faced the cruel reality that Esther’s illness is terminal. She was moved from the hospital back to her home and peacefully left this world. We all were in shock, and refused to believe that Esther left us. Her voice, her smile, and her music playing, keep surfaced in our memories. Though in deep grief, we practiced and presented the music in her memorial service. Esther, a talented musician, a fine teacher, a devoted Christian, and a trusted friend, remained in our memories. She is a generous person. In our weekly Chamber Music practices in her home, she always prepares delicious meals/snacks for us. She shared her resources without reservations. One night, she called me and asked me to bring my old German violin the next morning to meet Johnny at her home and had my violin repaired by Johnny. In another night, she called me and my wife to join her and her son, Samuel to visit Robert Cauer, a violin shop in Los Angeles the next day. They helped me to purchase a beautiful Germany-made antique violin; a dream came true for me after many-many years. She later gave me an envelope with the violin shop’s referral fee and persuaded me to keep it. She gave us concert tickets, music scores, etc. without expecting returns of favors. She is such a generous person even my neighbor, one of my wife’s good friends, remembered the hospitality she received when she and her friends visited Esther’s home. And that was my neighbor’s first encounter with Esther. She is a devoted Christian and a talented musician. Esther served in Churches’ worships either as a pianist, an organist, a string (violin/viola) player or a singer. She also played hand-bell. Esther is a humble and talented musician. She is a nature leader and willing to serve. Ms. Li-Ying Shang, conductor of Los Angeles Formosan Master Chorale gave Esther a nick name – – “才女”, which means “extremely talented lady”. Esther helped Master Chorale to recruit professional musicians for the orchestra in large concerts because she has many professional musician friends. She helped choirs to recruit musicians for string trio, quartet, and ensemble in small concerts because she has many skillful students. She helped Master Chorale to secure the rent of Concordia University Center for a couple of large concerts. Esther also is a member of Concordia Master Chorale. She was loved and respected by many conductors and composers, e.g., Mr. Oki Yang (楊子清), Ms. Li-Ying Shang (商麗鶯) and Mr. Tyzen Hsiao (蕭泰然). She is a fine music teacher. Esther obtained a Master Degree in Music from the University of California, Irvine. 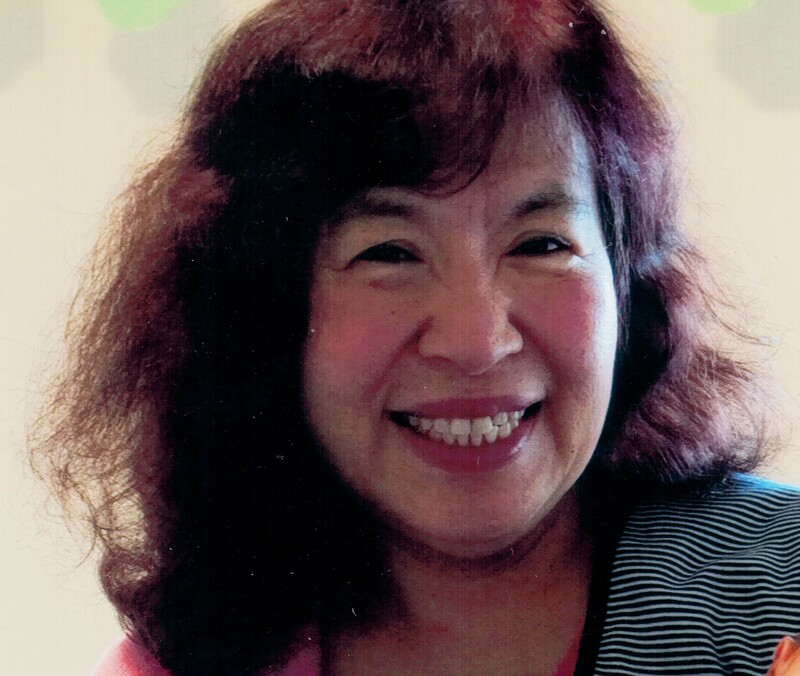 She taught private lessons of violin, viola and piano in Irvine until she died this year. Many of her students including her son, Samuel, went on to musical colleges and became professional musicians. For many years, Esther and Peter organized Annual Recital of Remembrance and Thanksgiving Concerts for the students. The concerts provided the students a platform to learn from each other. It also served as social gatherings for the parents and teachers. Esther loves her community and her original home country. Many Taiwanese organizations invited our Chamber Ensemble to join their concerts through Esther. 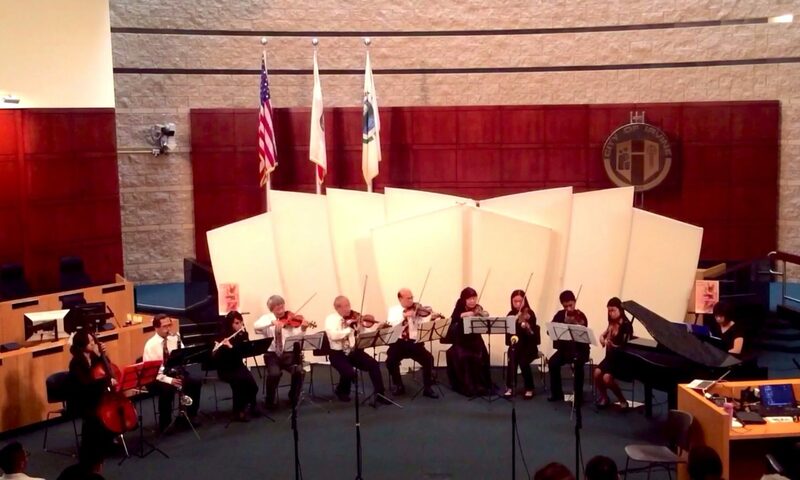 We performed at TECRO Orange County Office for couple years including one in 2014 to celebrate the Taiwanese American Heritage Week and the other one in 2015. Other organizations such as OCTA and NATPA had invited us through Esther, too. These activities were recorded in this web site. 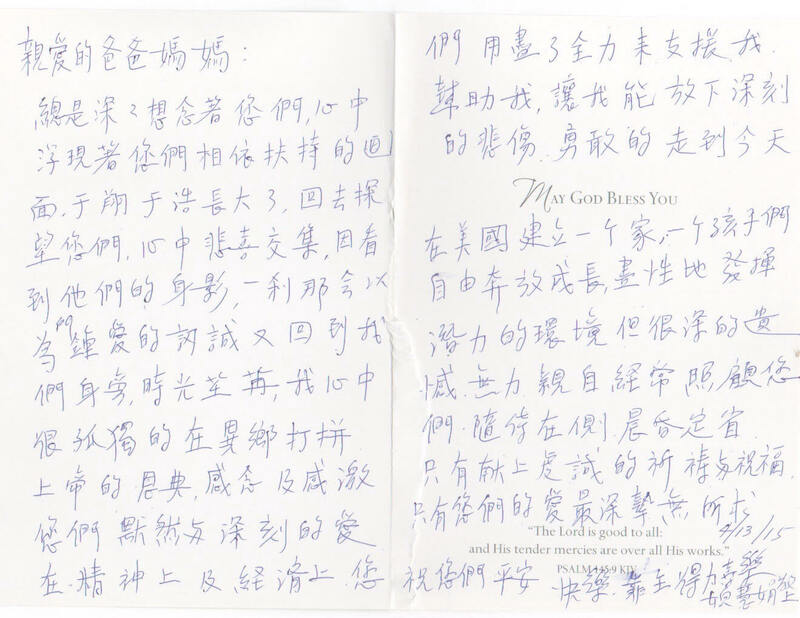 Professor Jen-Yang Chen (陳振陽教授, 台大交響樂團元老), a friend of us since our college years, sent us a song “She is our treasure (伊是咱的寶貝)” from Taiwan as a memory of Esther. This song best represent Esther, our precious jewel. We have a sense of loss and deep grief but want to keep her in our memory. I first met Esther and Dr. Ming Wu in National Taiwan University (NTU) Symphony Orchestra in 1972. We had great joy touring Taiwan and gave concerts in all major cities in 1973 summer. It was a large symphony orchestra which had more than 100 members therefore I did not get to know them well. After the tour, I left NTU symphony orchestra and played for the Taipei Municipal Symphony Orchestra for three years. We also toured many cities in Taiwan and gave concerts. I got paid to perform but these tours were not so much fun compare to the tour of NTU Symphony Orchestra. 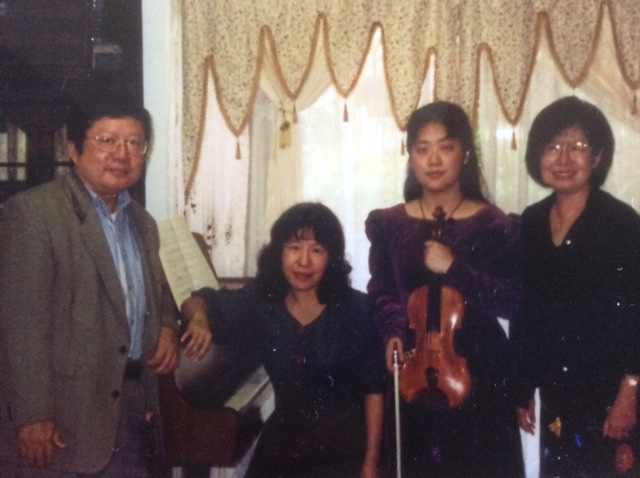 When Esther and her family went back to Taiwan after completing her Master Degree in Music, she met my brother, Dr. Henry Y. Chang. They taught in missionary colleges at Taipei together. Esther asked Henry to help find one of her friends, an Italian violinist in Irvine. Henry asked me to search this violinist for her. I was unable to find him. That is my second encounter with Esther. In 1991, the choir director of Evangelical Formosa Church of Irvine (EFCI) invited me to accompany the choir with Dr. Ming Wu. Afterward, Dr. Wu, Dr. John Hung and I started the NTU alumni chamber music group in EFCI. Dr. Yih Shin Wu, his wife, Li-An as well as Esther came to support us. Later, Dr. Wen-Chin Hsieh, Dr. Albert Yu, Dr. Ming Hsu, and many others joined and we have much fun playing music together. We enjoyed serving people in communities and churches with our music. We performed for all kinds of occasions, e.g., in nursing homes, churches , Irvine City hall, Taipei Economic and Culture Center in Orange County and scholarship award ceremonies in various hotels . By the Grace of GOD and the leaderships of Dr. Hsieh and Esther, this group grew bigger and bigger. In order to include musicians who are not NTU alumni, the name of our group was changed to “Whispering Pines”. After Dr. Henry Y. Chang rested in the Lord Jesus Christ, Esther helped take care of Henry’s piano and violin students. My sister-in-law, Shu-May also took violin lessons from her. Esther, her sons and her students had the first memorial concert for Dr. Henry Y. Chang in Taipei. The same year, Esther and her sons came to Irvine. They helped our Annual October Recital in Irvine to honor the parents of Dr. John Hung, my parents, the father of Dr. Hsieh as well and Dr. Henry Y. Chang who provided opportunities for us to learn music. They supported the Annual Recitals until 2008 when Dr. Ming Wu rested in the Lord Jesus Christ. I was too sad to continue this annual event, plus my wife was very concerned about my inherited high blood pressure problem. As my children grew up, my wife wanted me to stop teaching music so that when my children practiced music would not run into my students. Esther helped and took over all my students including one who had severe emotional problem that my son wanted me to keep. Because Esther inherited my mom’s kind heart and followed her nurse class motto – “not to be served, but to serve”非以役人，乃役於人”. Esther and her son, Samuel as well as my eldest brother’s four children took violin lessons from Professor Bedelian of UC Irvine. 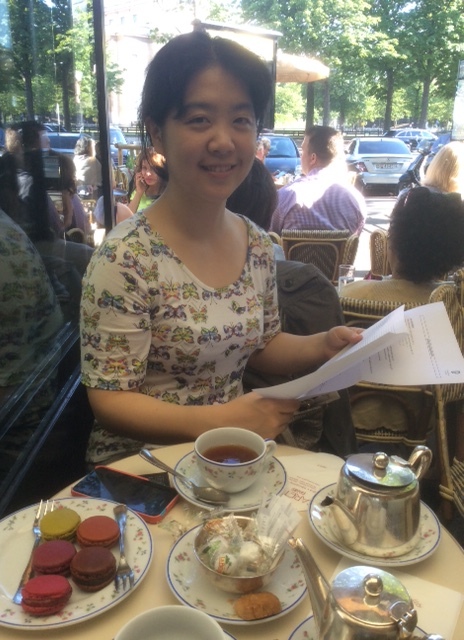 Esther’s husband, Dr. Ming Chao helped my daughter and son learned their high school calculus courses. Because of Dr. Chao’s effort, my children were able to pass with good grades. When my niece Deborah was studying in Princeton University, she over estimated herself and took math class one year more advanced than she should take and ran into difficulty. Deborah asked me for help on one of the math problem. The problem was solved within one day by Dr. Chao, Isaac (Dr. Chao and Esther’s son) and Dr. John Hung when I forwarded the problem to them. In addition to the good characteristics of Esther mentioned in Dr. Hsieh’s article, I would bring out two more. First, Esther’s sons, Isaac and Samuel were always supportive and happily performed in all her concerts. I never see any one can ask their children to perform in their concerts when their children grew up and became excellent musicians. When I have to ask for the favor of my children to help, they agreed most of time, but not really enjoy performing with me since I played too loud, off tune too frequently, and didn’t keep tempo as it should be. Second, Esther was never bothered by people’s bad behaviors, e.g., musicians tend to be jealous to people who are more talented than they are, and say things that were inappropriate. Esther ignored those critiques and kept us united together. Never did I hear Esther said any negative words about persons around her. Esther was really blessed with this beautiful personality. She really followed Jesus Christ and practiced His teachings in the “Beatitudes” – Be a peace maker so she is called “the child of GOD”. We missed her and we know that when Jesus Christ comes again, we will have much more fun playing music together. I met my second cousin Esther when she brought Isaac and Samuel back to the states to study here. From the beginning I knew how kind and generous she was apart from the incredibly wide set of musical skills. Her faith in the Lord was an inspiration to me and everyone around her and God’s blessings to her were shown brightly through her music and generosity. Her sudden leave of this world may be a shock to us, but we can only anticipate to meet her in God’s kingdom one day, where we will once again make music for the Lord in praise. Love is patient, love is kind, it does not envy, it does not boast, it is not proud, is not rude, it is not self seeking, it is not easily angered, it keeps no record of wrong. Love does not delight in evil but rejoices in the truth. It always protects, always trusts, always hopes, always preserves. Love never fails. The fruit of the spirit is love, joy, peace, patience, kindness, goodness, faithfulness, gentleness and self control. And now these three remain: Faith, Hope, and Love. But the greatest of these is Love. The Apostle Paul writes these words found in the New Testament, and these words from the Scriptures are the best way for me to describe my dear friend, Esther, and my friendship with her. Although brief, this friendship was full, rich, and increased quickly over a short period of time. God’s timing and purpose is impeccable, perfect, right and good. I met Esther when she was a substitute organist for me, as I was a soloist at the First Church of Christ, Scientist, Costa Mesa. During time working together, our musical rapport became so evident that we complimented each other so well every Sunday that we rendered worship to the Lord. One Sunday, I recall, I was so discouraged and defeated that I didn’t think I could go on and sing the solo for that Sunday. Esther graciously spoke words of love to me- spoke to my spirit and said:” Lets do this for the Lord, God!” And these words gave me the strength and power to go on. The last Sunday she and I worked together, I sang this song, “You Raise Me Up.” It went so well, so inspiring that Esther then invited me to her home to sing it for her friends and students. She then recorded me singing the song on her i-Pad and sent it to her friends and family. This song is very fitting for this occasion, not just because this was the last song we worked together; but more importantly, this is exactly what she did. Esther saw my musical talents and abilities and “Raised Me Up” to help me see and realize more clearly my gift. Later on, Esther became my piano teacher, and to my surprise gave me lessons for FREE- she would not except my money for lessons. In exchange for piano lessons, she said, that one day I could give her voice lessons. I will always look to Esther as an angel, for she blessed my life so richly! God placed her in my life for a reason, a certain time, and season to give me Faith, Hope, and Love. And for this, I am grateful to God for sending me a friend named Esther! To my beloved friend, Esther. I will never forget the image of you riding your bike to class at UCI while pregnant with Isaac – you did crazy stuff like that! You were fearless and a little reckless which is why you accomplished so much. You thrived on challenges. Everything you did, you did without reservation. Whatever you put your heart to it, you achieved it. Not only were you passionate about music, about learning, about teaching, you were passionate about all your friends. You treated us without reservation. You always knew where to find a nice place to eat and you knew which little boutique to search for unique treasures and where to go for a beautiful view. You found beauty in all sorts of things whether it was a little teapot, an antique bookcase, a laced vest, a pumpkin field. You taught me to appreciate beauty in simple things. There was never a dull moment with you. During those years at UCI, many of us were the recipient of your kindness and generosity. We would just hang out at your place and you would cook up something delicious. Even a simple sandwich or a bowl of instant noodle was so delicious at your home because you would put a special spin to your creations. You gave and you gave generously. You opened your home to us, you gave freely of your time, your love, your support and encouragements. I am grateful to you for all these great memories and I will miss you but I am comforted to know that you are resting in the Lord. Until we meet again. We lost a dear good old friend. It certainly is a big loss for us. Yet we hope your voice and image will remain in our thoughts, individually and collectively. Maybe God has other plan and took you away from us so unexpectedly. You left us with so many good memories. We will miss your sweet beautiful smile and your kindness as well as your friendship forever. Thank you for all of your love and care. Through your family, friends, students, community, and music, you touched the lives of so many people. We will all miss you. May you rest in joy and peace. You will always be remembered and missed by all of us. When a life is full, there is no regrets. 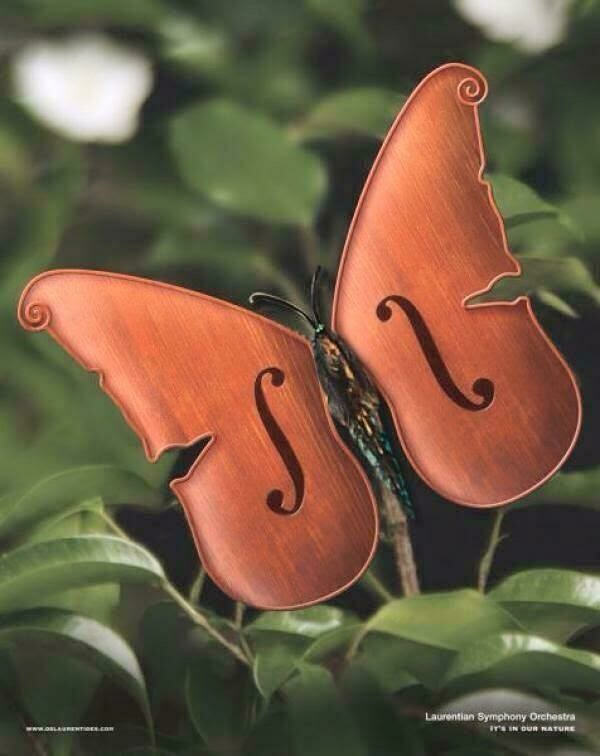 May beautiful music travels with you to where you go. 那份對音樂的投入與喜悅, 不認識您的人同樣感受得到。替我們剪輯 Metta Concert, 編輯視頻的朋友, 在將近兩小時的錄影中, 特別注意到您演奏時那些生動而美麗的表情, 他覺得很可惜, 音樂會當天沒能到場, 才失去近距離捕捉那些表情的機會, 您的喜悅有著巨大的滲透力, 您知道嗎? 前幾天跟朋友聊到您，她說最後一次見到您, 是跟太平洋愛樂交響樂團一起表演, 整個人神采奕奕、光鮮亮麗, 我想那是您在天堂音樂會上最貼切的姿態及寫照。陳老師, 您跟天父同在, 一定是祂最鍾愛、也最會演奏音符的天使, 祝您喜樂安好!